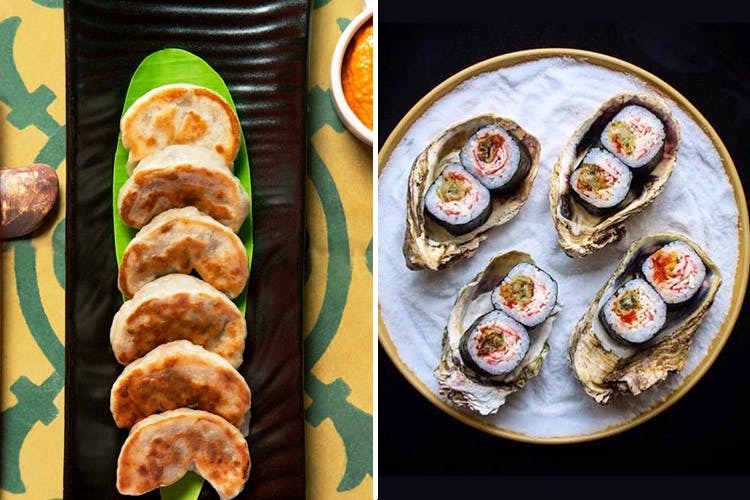 Asian gastro bar Fatty Bao has opened its second outlet in Lower Parel and we have all the details. Expect small plates, delicately rolled sushi, bowls of hearty ramens and more. Look out for the smoked green apple, avocado and takuan sushi, and the unusual yet delicious black rice sushi with scallops and miso. Those who prefer Nigri, order the brie with pickled plum, tuna with tosazu sauce or the salmon with balsamic glaze. Besides the wide selection of dim sums and open baos, try the new small plate selection, which includes scallops in shell with XO Sauce, crisp Korean fried chicken served with sriracha mayonnaise and Chinese roast pork puffs. Coming to ramen, tempura udon – a seafood broth with mirin, dashi, soy sauce, tempura vegetables and prawns can be ordered for a sense of comfort. There’s Dan Dan noodles with pork, and zucchini blossoms stuffed with tempura prawn and chili bean sauce. Cocktails are based on ‘Root to Fruit’ philosophy. Your drinks come from the garden to the glass, where cocktails are made from house-made syrups and different parts of plants. Flowers, seeds, leaves, roots, stems and even the pods are used in their cocktails. Those who like to keep it simple can order their classic cocktails, wine, single malts and premium spirits. Date night after work? Or an important meeting? Head to Fatty Bao. You Drive Me Noodles: Can’t Get Enough Of The Ramen Bowls At The Fatty Bao!